Seriously. Sorry, I’ve been missing all week. It’s been full of mayhem and craziness. Poor Baby E had a terrible ear infection and suffered a ruptured ear drum. Needless suffering in my opinion. After days of him not being his normal self with out any specific complaints, he decided that sleep was no longer necessary and he was fussy. So, I took him to the doctor. Yes, I was afraid of the ‘ole “teething” or “it’s just a virus” diagnosis. He had swollen gums so it very well could have been just teething. After torturing Baby E, and it was a torture, the doctor’s diagnosis was “just teething.” He screamed and cried when she was checking his ears. I had to help hold him down too. It took a good 5 or so minutes just to get him calmed down after she was done. Anyway, that night he screamed and cried all night. Hubby and I took shifts taking care of Baby E and trying to get some sleep. By 3 AM his ear was oozing stuff and by 7 AM his ear was bleeding. So, not just teething, a ruptured ear drum. Ugh! No wonder he screamed and cried all night! We called our doctor when they opened, and his regular doctor called in a prescription. Baby E is on the mend. Maybe it was lack of sleep, who knows, but on Wednesday, I managed to hurt my knee. How? You know, by doing something stupid, like sitting down on the couch. I felt my knee cap go out and then pop back in. There was also a lovely “crunch” that went with it. I knew I was in trouble. It really, really hurt. It was the same knee that I hurt in college and had surgery on. So, then I was at the doctor. I slightly tore something. Don’t ask me what, I have no idea, and if he told me I would have been just as clueless. Anyway, I’ve got to wear a knee brace for 3 weeks. I have to wear it all the time – even when sleeping. Oh, and I need to “minimize” picking up Baby E. That should be fun. So, I guess, really long story short. I haven’t been ignoring you, it’s just been crazy here. All should go back to normal this week. Okay, well except for the Thanksgiving holiday. I may be missing for a few days then. You understand, right? 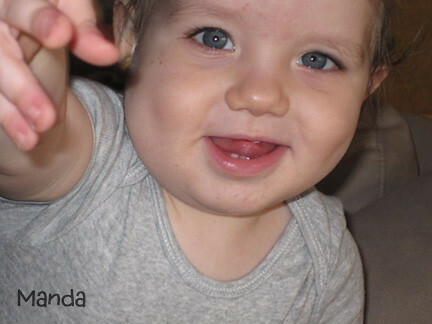 Here… I’ll leave you with some Baby E cuteness. Cuz we all need some of that, right?